Cutting through concrete and milling asphalt are no easy jobs, but with the Bobcat planer attachment, they’ve never been easier to handle. For optimum maneuverability at a much lower cost than the leading dedicated planers on the market, turn to this Bobcat genuine attachment. Bobcat’s genuine planer attachment comes with a load of features, including precision planer skis and depth gauges. The attachment is built so that the operator has clear visibility of the skis and depth gauges from the cab. The bits mounted on the planer’s revolving drum are carbide tipped, making them ferocious and able to pulverize through the toughest materials. When you’re done with your job, the Bobcat planer makes cleanup super simple. You can easily recycle your milled materials and finish any asphalt work nicely. 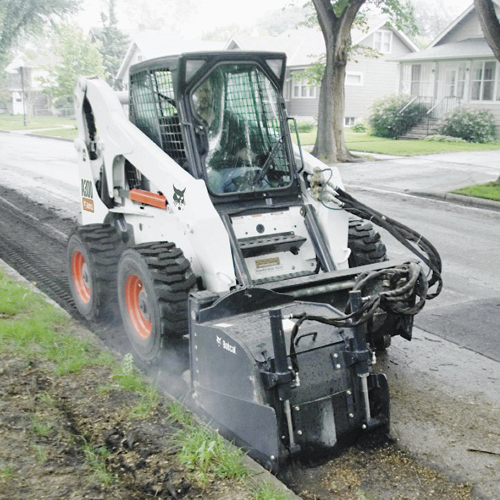 You can even taper roadway edges, cut drainage in concrete, and mill around manholes and other milling machines. Like any piece of Bobcat equipment, the planer is durable, versatile, and easy to operate. You can set and maintain every aspect of the job you need to complete, including the slope control, width, and depth right from the comfortable operator’s seat. Maximize your performance by choosing between four specialized planer models with a variety of drum options to suit the requirements of any job. Each model comes in your choice of standard flow or high flow, so whether you plan on using it every single day or just a few times a year, you can maximize your performance by customizing the attachment to suit your needs. The milling process involves low angle, high velocity blows in a controlled pattern that uniformly chips pavement. Depth, width, and slope control are easily set and maintained by the operator. Milled material can be immediately recycled, nicely finishing any asphalt and repair jobs. The Bobcat planer attachment is much less expensive to maintain and more manoeuvrable than dedicated planers.